What enginge model do I have? The engine cover is black, with a silver manual or instruction printed on the pull start. Black plug cover, and a round red kill switch. Beside the serial number is printed G2D96. IÂ´m interested because IÂ´m looking at larger cylinder kits and IÂ´m not sure if the ones for a 230 will fit my engine. I am not sure as to the differences between the Zenoah engines. 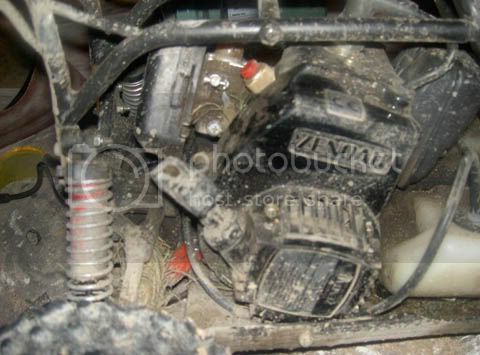 IÂ´m pretty sure IÂ´l have to get a new carb as well, as I've read the older one is not as good as the new (hopefully! ). If it is too much hassle I will most likely get a completely new engine, but IÂ´d like to upgrade the one I have if possible. RE: What enginge model do I have? It sure sounds like you got the Zenoah G2D Engine. Both the Carson and the SiKK are actually CY engines, and they are clones of the Zenoah G260. You will need new engine mounts as the G2D and the G230/G260 has different mounts. Since you are inside the EU, it might be easier and cheaper to go the Hobbythek Way, but if you chooses one of the many US shops that cary SiKK, then ask them to ship using USPS, it is often slower but shipping cost is a lot cheaper than FedEx or UPS. What if I want a bigger cylinder on it? For example Oneill has kits for the g23orc, he23hp, st23rc, st27rc, he26hp, and the g23lh motor. These are Sikk engines right? IÂ´ll have to look for kits for Zenoah engines in that case... Do you know of any? Late model cylinders do not fit the G2D engine. The new engines have two cylinder bolts whereas the old ones have 4. And the ports of cylinder and crankcase wouldn't match. If you considered buying a new cylinder/piston and a carb, you'll better go with a complete new engine. Almost the same money, but all new parts and better performance. You'll only need to get a new small engine mount, the large one is the same as with the old engine. And whatever you do, get a better air filter!!! The stock unit is bs for offroad. Haha yeah guys I will! Just came in from a bit of driving, thatÂ´s why the car is waaay dirty. I agree that a completely new engine is better in the long run, that way IÂ´ll have a spare just in case. A tuned pipe will come first, though. IÂ´ll also get a better filter, I got the car not long ago and my local shops do not stock FG parts, IÂ´ll have to order from abroad. In the meantime I avoid dry dusty areas. But still the car runs well and I donÂ´t feel an emmediate need for a more powerful engine, hey the car spins the wheels on all surfaces, straight ahead and when turning! The car lacks grip more than power, thatÂ´s for sure. Just drive against someone with the new engine. You won't believe how fast you can change your mind. Depending on the pipe the difference between the price for the pipe or the engine may not be that big. But you'll definitely get more power from the new style engine. The new engine with stock "muffler" should outperform its predecessor eqipped with a pipe. But first of all, get a real good air filter, not those bling k&n paperfilter crap. Try to get a real good foam filter, then your worries are over, and don't forget to clean it once in a while and oil it and a nice prefilter (you can use something from home, a sock or something) that would be great. Thanks Automan and you others. I have been looking at the exact same filter you recommend Automan, good and cost effective. IÂ´ll order it and have it by wednesday or thursday... IÂ´ll use a sock until then. IÂ´ll keep my eyes open for a good used 260 later on. It is more a matter of what good used parts that happen to come my way in the future, engine or pipe.